Forum Description: This section is for vendors or members who offer products or services. VENDORS, Please post here and not in the general tech forums. 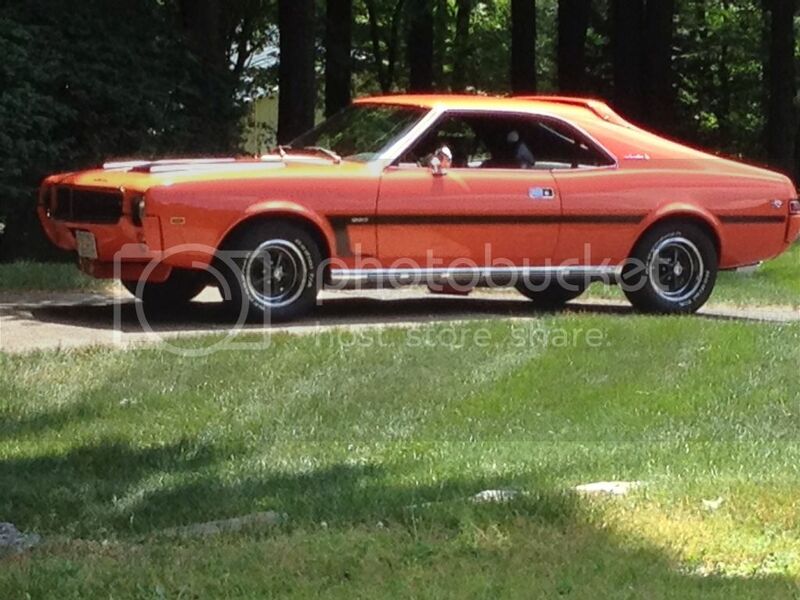 Posted By: 71 Javelin AMX O.O. Rusty is great to work with, mounted the fresh F70-14 Polyglas RWL last weekend and going on my folks 74 Matador X today.....thanks for keeping up good communication. That's a good point Ross. Rusty's proactive communication is second to none! I know that once I decide to make a purchase with him, it's going to be hassle free. Will keep Rusty in mind when it's time for some Goodyears..
An endorsement from Rick is good enough for me. Thanks for the re-afirming me on the future availability, Rusty. I am always available for any questions you may have. My cell is 816-654-3400. Tires are in stock for immediate delivery. Please let me know if you are waiting tires delivered to MCACN. Also, a reminder tire pricing is going up 11/1. I want to reach out to you one final time before the price increase. Tire prices go up on 11/ 1. Please contact me so that I can make sure that the tires you are looking for are available and saved. Also, if you want tires delivered to Chicago for MCACN, contact me so that they can be reserved. $10 delivery to the event!!! November 1st is the date of the price increase. The tires will be going up $10/tire. Contact me for pricing. My cell is 816-654-3400. I am still taking orders to be delivered to Chicago for the Muscle Car and Corvette Nationals. This event is November 19 and 20 at the Stephenson Convention Center and is one of the best Muscle Car shows in the world. I can deliver preordered tires to the event for $10/tire. Reaching out one last time before the Muscle Car And Corvette Nationals in the Stephenson Convention Center, Chicago, Il, November 19 and 20. I will be attending with a booth on the main floor, so come by and discuss any ideas, issues, or just BS with me. I am bringing pre ordered tires for delivery at the event. The tires will be brought to the event for $10/tire. Contact me if you want tires brought to the event. My cell is 816-654-3400. Might be a silly question but it never hurts to ask. Do you offer both Goodyear Polyglas GT's and just regular Goodyear Polyglas? Reason I ask is that I have a pair of D70-14 Polyglas RWL tires (non GT's) and wouldn't mind another pair to complete the set, but I can't seem to find non-GT Polyglas' listed anywhere. Neither can I find D70's. Do you offer D70-14 RWL Polyglas tires? Sorry, but Gettysburg is not on my list this year. Where is the AMO going to be next year? Cougar 50th Nationals-- Tulsa, OK April 21 and 22 <<<<< Are we talking about a cars here? Yes.... Mercury Cougars... you smart alex!! Pontiac Museum Show-- Pontiac, IL Sept 17. I see that there are now Firestone Wide Oval radials that look just like the original bias ply tires from the late sixties and early seventies. Are there going to be Goodyear Polyglas radials with raised white letters and redlines coming soon? Kelsey has always prided himself on producing the most accurate reproduction available. To that end, he is not going to produce something that never was. He is producing vintage era radials from the 70's and 80's in 15" sizes. Give a call if you have questions. 816-654-3400. I was just curious. I always thought the Goodyear Polyglas design was the best looking and have had them on several cars I have owned. Also they were factory installed on many AMC's. It seemed like a interesting choice to be able to have the best of both worlds. I agree. The recently released Firestone Wide Oval radials seem to have the best qualities of the original appearance and the ride and handling improvements that radials provide. I'd love to have Goodyear Polyglas radials for my AMX but for now I'm making do with Diamond Back Michelins with redlines which are very good. I'm surprised about Ross's statement regarding the ride (and handling ?? )of the new Polyglas tires. My experience with the original Polyglas on my AMX was that they were fair at best and terrible in the rain. When I went to my first set of Good Year radials, back in the 70's, the improvement in ride and handling was enormous. Later switching over to Michelin X radials, FR70 x14, from the Good Year radials was an equally dramatic improvement. With all these tires costing in the $1000. or so range for a set of 4 it get's expensive to begin to experiment with different tires. I love the OEM look of the Good Year Polyglas and if they're as decent as Ross says then I'll likely put them on my 67 Ambasaador DPL when it's out of the body work stage. Otherwise it will probably be the BFG or Diamond Back radials with the thin white stripe in either the 205 or 215 x14 size. George....all, I just put a set (F70-14) on the "worst case scenario" as the 74 Matador X...just considering the weight is 1000 lbs +/- more then a 2 seater AMX. It drives better then the Goodyear Eagle ST's (215/70-14)that were on it before. A very good friend has them on his Superbird....F70-14's too, and he is impressed with traction and handling and that thing is a tank!!! !, it has to be heavier then the Matador. I personally balanced them on my 25 year old Snap On balancer, they took very little weight and the threads were smooth and straight. The car drives very smooth, I drove to Hershey and back in October last year (450 mile round trip), no complaints. Rusty supplied me with this set and he was great in communication and delivery. I have driven my one 69 AMX that still wears it's original Polyglas Red lines and it is rough and the compound is hard......but it is a survivor, George is very familiar with this car (Lee's Beale Street Blue car). Are they a radial NO, but they are 10 times better then the original 1968-1970's version as built by Goodyear. I guess that puts these into serious consideration when the time comes to replace the tires on the DPL. OEM stock size was 7.75X14. Optional upgrade size was 8.25 X 14. I guess that would translate to either a F or G 70 x 14. I'll probably go with the "G's. The Good Years would be my first choice as far as the OEM appearance goes. If they ride and drive as well as Ross relates then I'll likely go that route. I'll need to price them out through Rusty when the time draws nearer. George....you can come down and drive the White X anytime....if you want to compare. Give me a call anytime if you have any questions. 816-654-3400. If you are wanting to have tires delivered to any event, please contact me. The earlier you contact me, the more likely I will have your tires available. Next Friday, April 21st, I will be picking tires up for the Cougar event in Tulsa as well as the NCRS meet. The Cougar event will be at the Exchange Center @ Expo Square in Tulsa. The NCRS meet is being held at the Iowa Speedway. If you are wanting to have tires delivered to any event, please contact me. The earlier you contact me, the more likely I will have your tires available. F60-15 Polyglas are leaving as fast as they come in. Please contact me in advance so that we can have you on the back order list and make sure that your name is ready for the next shipment!! Time for my next event..
Time for my next events.... June 3rd is Boss Motors in Marysville, KS and June 8-10 for the Shelby National meet in Indianapolis at the Speedway. Have a great Memorial Weekend. Remember the reason for this holiday!! Please give me a phone call!! If you were having problems with the tires, you should have contacted the person you had sell them to you. 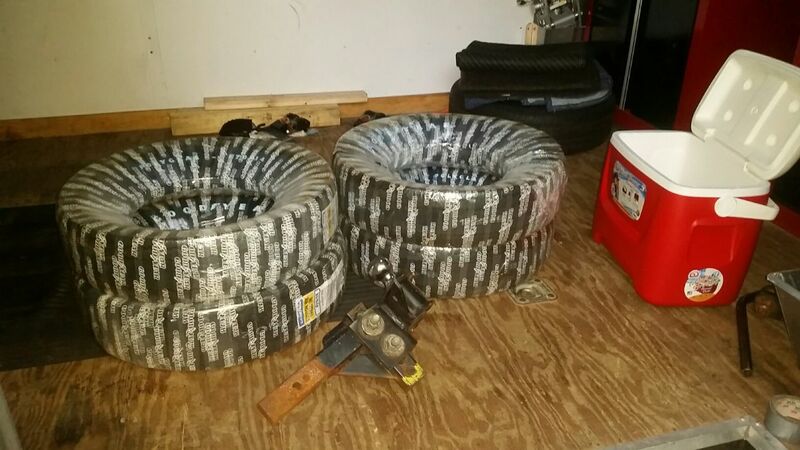 These tires are expensive, but they are not junk. I would be happy to talk about any if your issues. 816-654-3400. Well, I guess the replacement Goodyear Custom Power Cushion Polyglas D78-14's I have, originally put on my car in 1978, and have only 1300 miles on them, are getting long in the tooth! The tread looks like new, some nubs still visible, sidewalls are nice, and no heat checking or cracking. They did spend the next 37 years in a garage after the owner passed, so they did not see light until 2 years ago. I removed them from the original wheels, cleaned up the rims, as they had slight rust on the bead area, and I re-installed them with inner tubes, for safety, to drive to shows when installed.They are currently put away for show only, and modern radials are on the car as a driver, just wanted to see reactions. Rusty, what is the usual time frame from order until shipping? I want some new polyglas for my 70 AMX next summer but want to wait if possible as they won't be used all winter anyways. Any plans on coming east this coming spring ? Planning on Hemmings Musclepaloza in May and looking at Chryslers@Carlisle in July. On your list for some tires Rusty, I'm looking forward to great looking poor handling tires! I think you will be impressed how the tires do ride and act. Pressure the tires to the door sticker and set your alignment to the original specs. Thank you for your purchase!! Temporary world headquarters for Rusted Tires this Thursday to Saturday.... Pate Swap Meet at Texas Motor Speedway... Ave 10, spots 936 and 938... block 76. Cell is 816-654-3400. Follow ‘Rusted Tires’ on Facebook! Your one stop for Goodyear, Firestone, B.F. Goodrich reproduction tires and Wheel Vintique wheels. Was great talking to you at Musclepalooza Rusty, hopefully the Olds will be back on the track soon. Congrats on the award in New York!!! Thanks, always great showcasing our beloved AMC! Aug 10-12 Indian Uprising, St. Charles, IL. Contact me if you want tires to show to an event or to your house. Pontiac Indian Uprising at the Pheasant Run in St. Charles, Il Aug 10-12. Can you say free shipping? Continued on Goodyear Performance Series Reproductions!! Fresh shipment of F60-15’s, F70-14’s, and E60-15’s! !